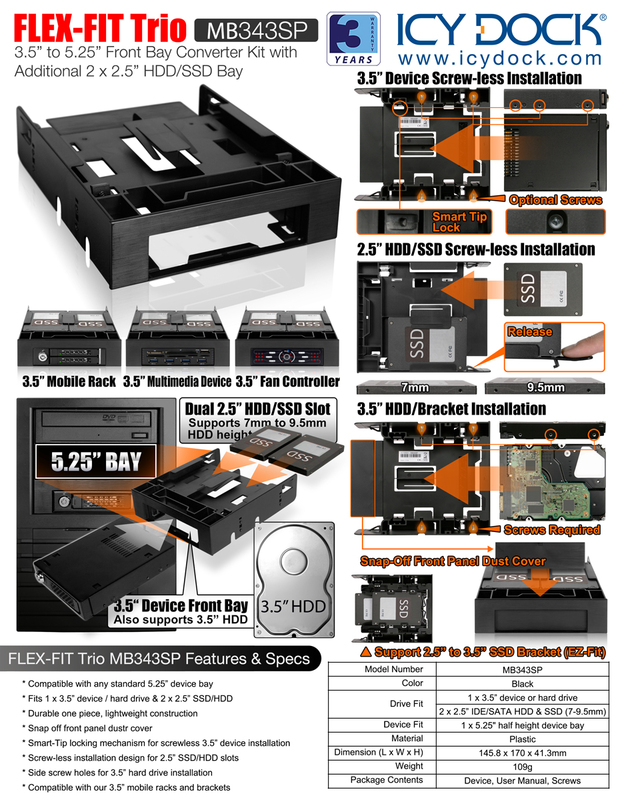 One of the most unique features of the FLEX-FIT Trio MB343SP is the FLEX-FIT system, which provides users a higher level of flexibility for a 5.25” adapter that only an Icy Dock product can deliver. 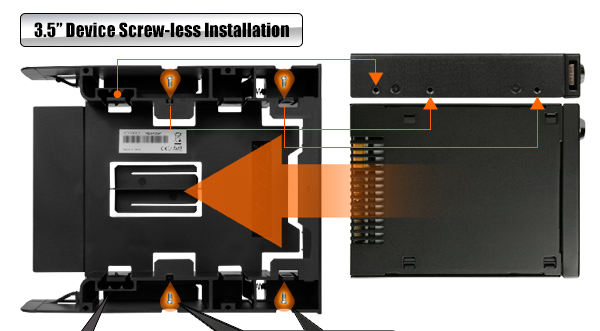 The FLEX-FIT Trio can store a 3.5” device or hard drive and an additional 2 x 2.5” HDD/SSD, IDE or SATA hard drives from 7mm – 9.5mm height. It’s both space efficient and cost effective since you won’t be required to buy multiple brackets. 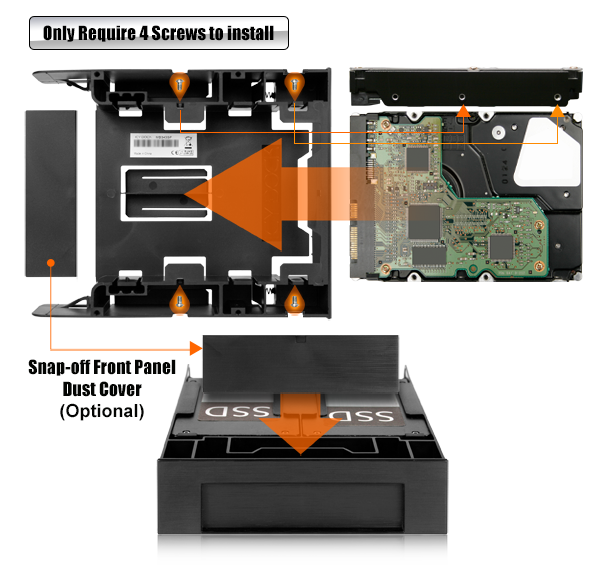 Thanks to our screw-less drive installation design, the device / drive installation process is very easy – simply slide in your 3.5” device until you heard a clicking sound, which means the Smart-Tip locks the 3.5” device into place. For extra security, the optional side screws can be added. 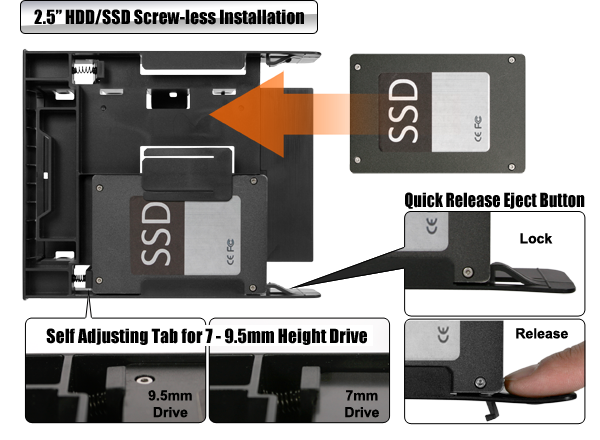 For the 2.5” HDD/SSD slots, it takes any 2.5” SSD or hard drive without using any tools or screws, and the built-in self adjusting tab locks in 7mm-9.5mm 2.5” drives in place. The FLEX-FIT Trio MB343SP is engineered with the utmost dedication to building the most efficient and reliable product possible. Using a single, sturdy plastic open frame design provides excellent durability and passive cooling factor which as a result, reduces the chances of mechanical failures while using the device. Because the adapter is a single piece design, it is using absolutely zero moving parts as possible while retaining all core functionalities of the adapter. 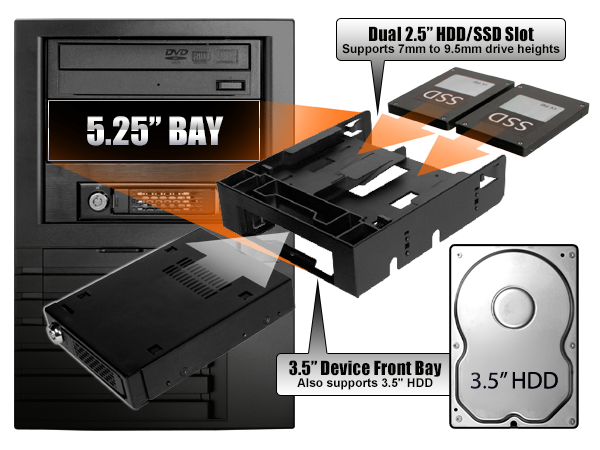 Since the 3.5” bay takes both 3.5” hard drive and 3.5” device, there are many build options to choose from. For example, adding the ToughArmor MB992SK-B would give you two internal 2.5” slots with two external hot-swap 2.5” bays. Adding the EZ-Fit Lite MB290SP-B will give you four total 2.5” slots. 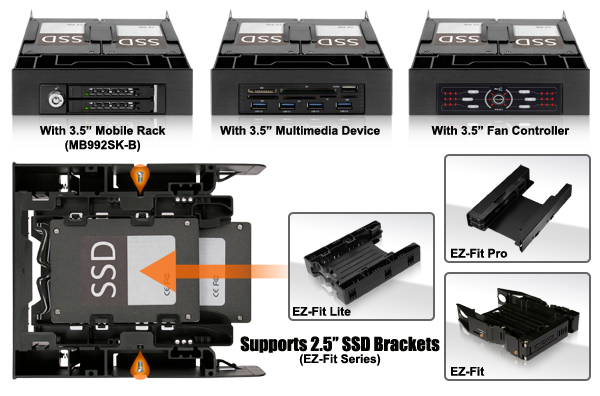 The FLEX-FIT Trio is also compatible with USB 3.0 hubs, multimedia card readers and fan speed controllers in 3.5” form factor.